At the end of his busy life, the first Roman emperor Augustus (63BC -14AD) wrote a testament in which he described all his achievements as a ruler. The famous text is known as the Res gestae, from its introductory line Res gestae divi Augusti or the deeds of the divine Augustus. In accordance with his will, the text was engraved on bronze plates placed outside his grand mausoleum in the Campo Marzio area of Rome. The original plates did not survive, but because the text was engraved on many temples throughout the Empire, a full version of it came down to us. The most intact version was actually identified on the temple of Augustus in Ancyra (modern day Ankara in Turkey) in the 16th century. Today, it is engraved on a wall facing the emperor’s mausoleum on piazza Augustus Imperatore in central Rome, and is part of the new Ara Pacis building designed by American architect Richard Meier, the first contemporary building to be erected in the historical centre of Rome since the 1930s fascist era. It was Mussolini’s idea to regenerate the area around Augustus’s mausoleum and move the ancient Ara Pacis monument, or the arch to peace which celebrates Augustus as a peace maker, near his tomb. The Ara Pacis was originally located nearer to the Pantheon and for centuries, only fragments scattered around Rome remained (one of the original plates can actually be seen on the wall facing the garden at the villa Medici on the Pincio). In the mid to late 1930s, Mussolini undertook a large rehabilitation project in commemoration of the two thousand anniversary of Augustus’s birth. The area around the mausoleum would be rebuilt and the Ara Pacis would be put back together near it. Everything had to be ready for a grand opening on 23 September 1938, the day the celebration was due to take place. The schedule was very tight, so it was decided that the architect commissioned by Mussolini, Ballio Morpurgo, would build a temporary pavillion to house the Ara Pacis. 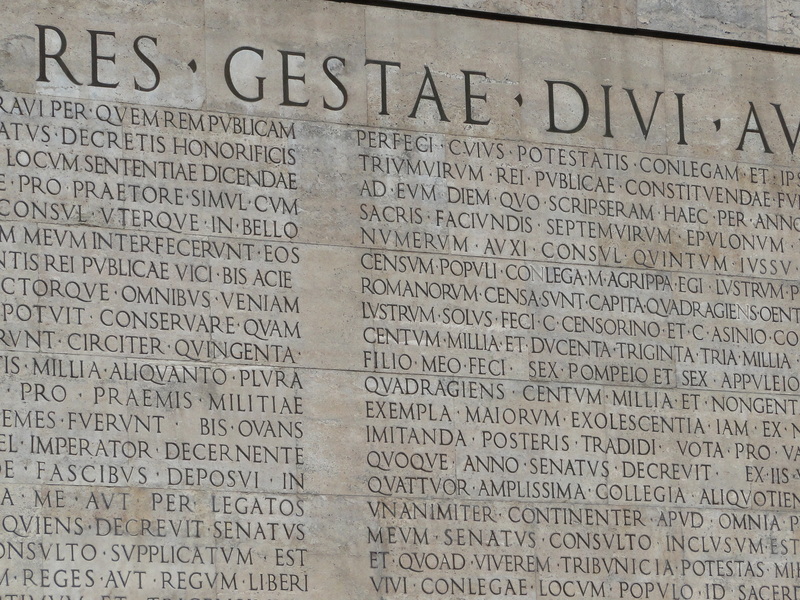 The idea of engraving the Res gestae on a wall facing the mausoleum to honour again Augustus’s will, goes back to those times. 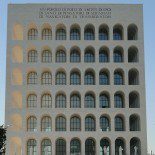 With his fascist regime, Mussolini was desperately trying to revive the greatness of the Roman Empire, and with great pride and pomp, he inaugurated the newly restored Ara Pacis in its new home on the 23rd of September 1938. However, the second World War broke soon after, so the whole restoration project was stopped and the temporary Ara Pacis pavillion remained there. As the actual monument inside was deteriorating too fast due to excessive dampness and inadequate protection, the government and the city of Rome took the decision in the mid 1990s to replace the pavillion with a brand new building. However, the wall with the Res gestae inscription had to be left untouched and incorporated into the new design. The new museum opened in September 2005 and to this day, people remain divided about it. 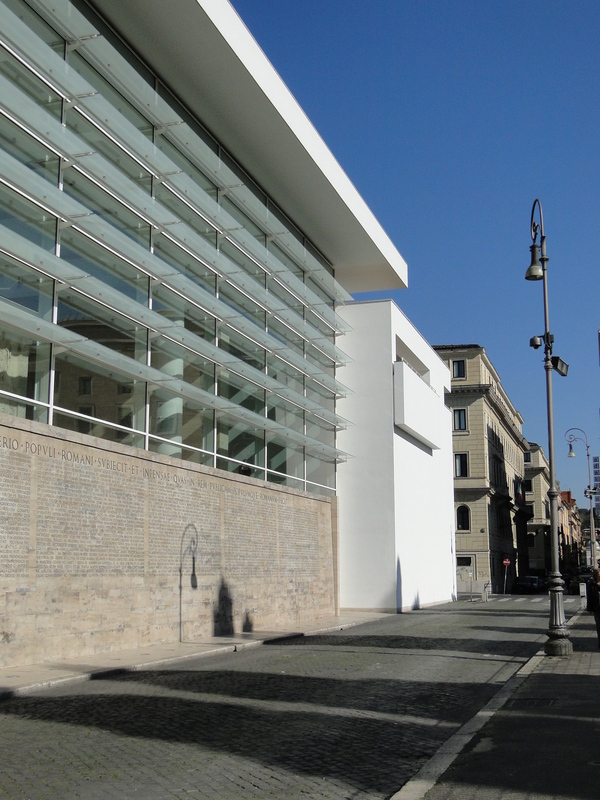 The current maire, Gianni Alemanno, infamously said in his election campaign in 2008 that the first thing he would do once in office would be to demolish the Ara Pacis building! Personnally, I am in two minds about it: I like the geometric design of the building and the use of material, but I’m not sure I like it where it is. I don’t remember seeing the 1930s pavillion when I first came to Rome, but looking at photos it looks like it was simple and stylish enough to put the Ara Pacis monument to the fore. The current building may be a bit too imposing, but maybe it should be since it is home to such an important monument. It has however managed to create a new atmosphere in the area, which is in itself an achievement for a public building. This entry was posted on December 2, 2010 by Salambo in Ancient Rome, Arts and culture, Contemporary Rome, English, Mussolini's Rome, Rome's neighbourhoods and tagged Ankara, Ara Pacis, Augustus, emperor, italy, Mussolini, Res Gestae, Res gestae divi augustus, Richard Meier, Rome, testament, Turkey, wall.